Leave a message for BROPHY family members. I'm looking for more information about my Brophy family. 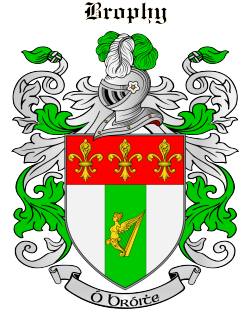 My 4th GG William Brophy was born in Ireland in 1788. At some point he ended up in Knox County Virginia married to Ellen Brennan from Maryland and had Daniel in 1833, John in 1834 and George in 1835. I'd like to know where he was from, who his parents are, when he came to America and why...for starters. Thanks!! My family lived mainly in Kentucky. I am looking for anyone who may have been related to Libeas Lily Brophy, who was born in Indiana in 1828. He was married to a Sophia Gregory and a Ruth Ann Mussets. If anyone out there has any information regarding him and his ancestors, please let me know. Invite more BROPHY family members! Click 'Invite' to connect with more members of the BROPHY tribe.